1. 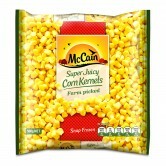 Add McCain Corn Kernels, tomatoes, beans, coriander, red onion and lime juice to a medium mixing bowl, stir well to combine and set aside. 2. Scatter corn chips or tortilla crisps evenly in a large oven proof dish, top with jar of tomato salsa, sprinkle with tasty cheese and place under a hot grill for 3-5 minutes or until cheese is golden and melted. 3. 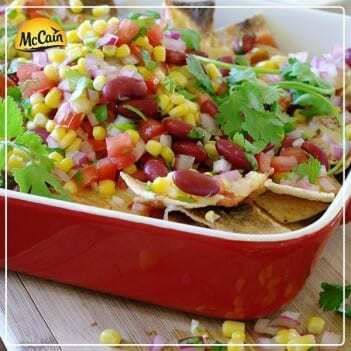 Remove corn chips from grill and top with McCain Corn Kernel salsa. 4. Serve immediately with sour cream, sweet chilli sauce and garnish with coriander sprigs. 1 Add McCain Corn Kernels, tomatoes, beans, coriander, red onion and lime juice to a medium mixing bowl, stir well to combine and set aside. 2 Scatter corn chips or tortilla crisps evenly in a large oven proof dish, top with jar of tomato salsa, sprinkle with tasty cheese and place under a hot grill for 3-5 minutes or until cheese is golden and melted. 3 Remove corn chips from grill and top with McCain Corn Kernel salsa. 4 Serve immediately with sour cream, sweet chilli sauce and garnish with coriander sprigs.